Originally thought to be a one-off, but now more have come to light since this post was originally written in September 2016. 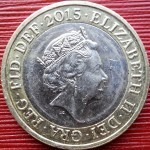 This is a newly discovered 2015 Britannia £2 coin error that concerns die alignment. 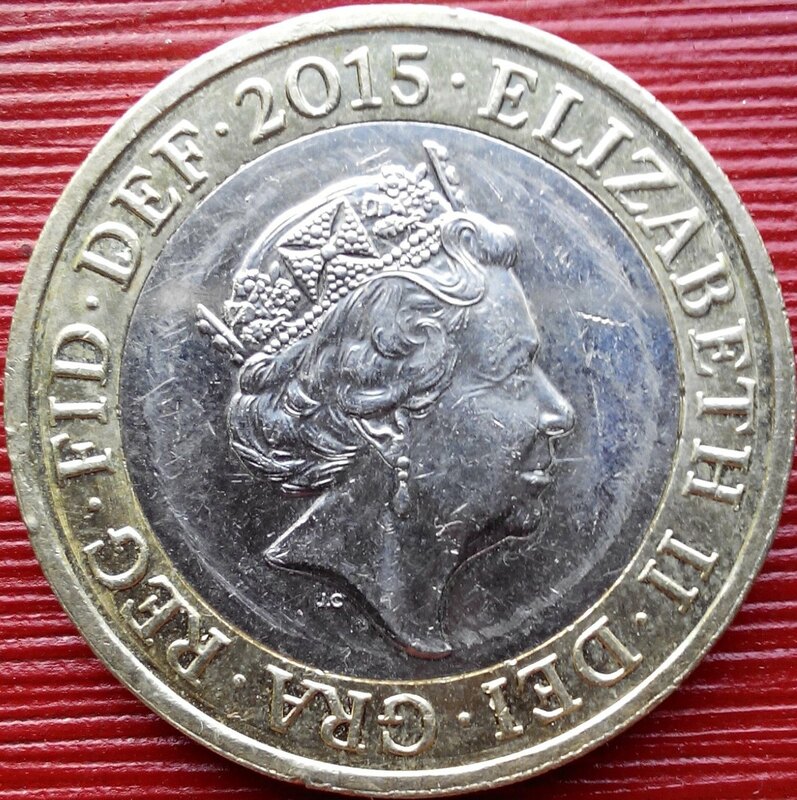 Normally all modern British coins are aligned such that the when turned on a vertical axis (finger and thumb at the top and bottom of the Queen) the reverse should also be the right way up, i.e. Britannia’s head should be at the top in the 12 O’clock position. This is what numismatists call medal alignment. For a few 2015 Britannia coins (and possibly a lot more) one of the dies has rotated resulting in incorrect alignment. When the ‘heads’ side is held at the top and bottom and the coin is rotated, Britannia’s head is facing towards about 4 O’clock, and is therefore out by about 100 degrees. Another has been seen which is almost upside-down, i.e. more than 100 degrees. Such errors shouldn’t be possible as the Royal Mint fix the dies in position and they shouldn’t be physically able to rotate. This error was first confirmed by checkyourchange.co.uk in September 2016. If you have one of these die alignment error £2 coins, please let me know. The Check Your Change admin is Mr C H Perkins, publisher of numismatic publications in printed and eBook format. Author of "Collectors' Coins - Decimal Issues of the UK" and other books on British coins and related subjects. Great. 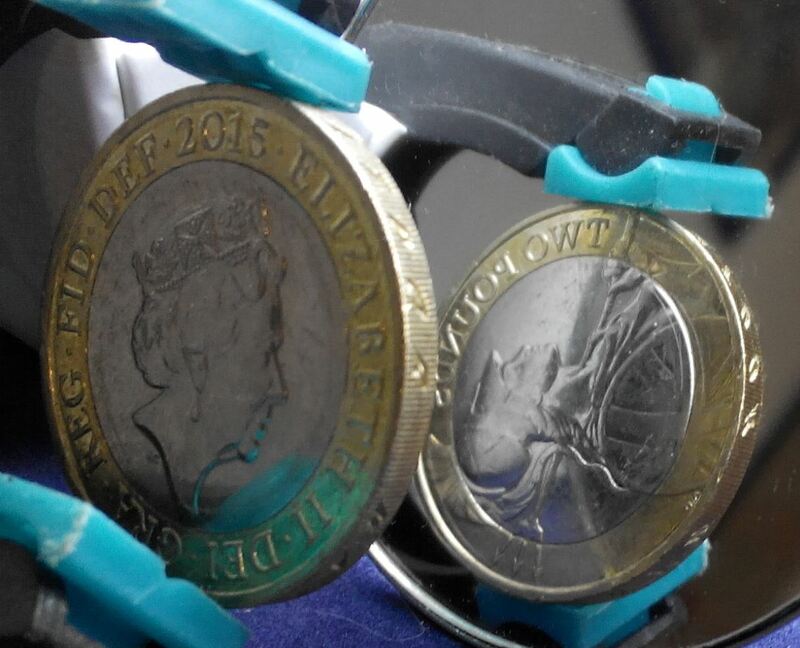 Can you email a pic with the coin in front of a mirror (so both sides are visible at the same time) to info@checkyourchange.co.uk. Thanks. I have just been given one of these coins I my change and although unusual in itself, I have noticed that the front and back are not aligned. Is it the same alignment as the coin shown in the pics? Can you email images (ideally with a mirror so both sides are visible) to info@checkyourchange.co.uk. Thanks. The actual coin with the wrong alignment? If so I need to see pics of it in front of a mirror so both sides can be seen at the same time. I have one of these too! What is the value? Can you verify it with pics in front of a mirror? Hi we have 1 of these coins but when the queens headis on the top the writing around the sides is upside down? That’s normal for all coins with writing on the edge. The letters are either one way or the other. Hi I have one…what is it worth? I’ve not seen one sell for a while. Error coins are hard to sell on ebay as every 2nd plonker seems to describe their coin as ‘error’, ‘mule’ etc. I also get enquiries from people that just have a normal coin with normal alignment. Are you sure it’s the error version? Good find. Where and how are you selling it? Sorry for the late reply CYC-Admin, I’ve sold it to a London coin dealer for £200 😀, did I do the right thing ? Was it worth more or less, I had no idea how much their worth. Sounds a lot to me. I don’t think any London dealers I know would have been that bold to pay £200 for it. There was one on eBay that someone was asking £150 for but didn’t sell. I’m afraid I can’t use £200 as a guide value, unless you can provide me with the details of who bought it (over email, not in public). 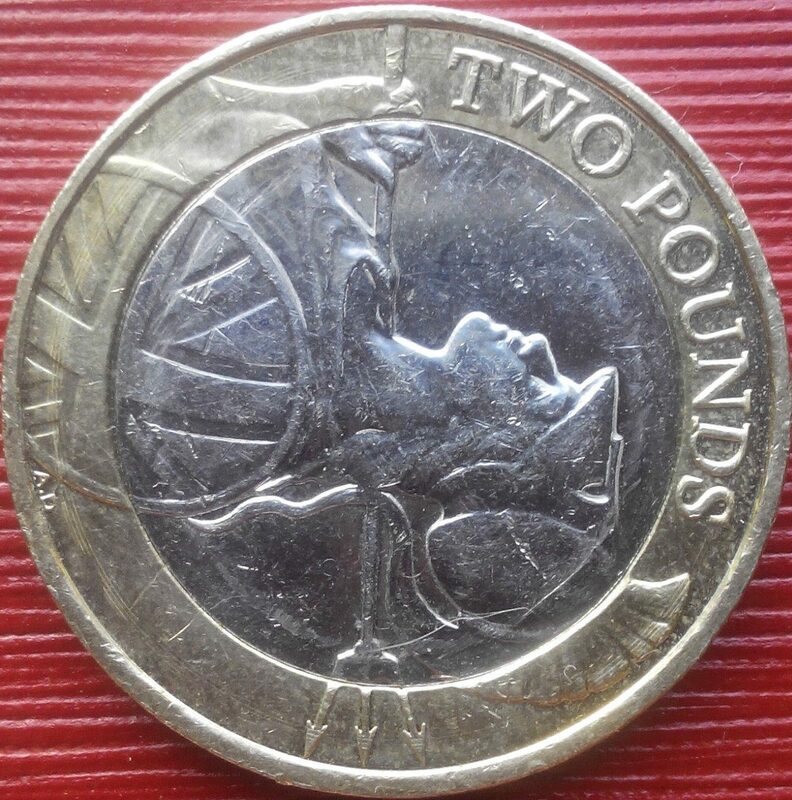 I have 2 of the britannia £2 coin 2015 if it’s one of the mis printed ones will that put the value up ? Yes, definitely. But just by how much depends on who you can find to buy it. I have one which I notified Change Checkers about a couple of months ago and was told that it was probably a fake. I have submitted photographs & would be keen to know a value. i have a brittania two pound coin with the i missing in the word vindico mine reads v ndico ? Quite often the downward strokes can get sort of lost in the rim milling and appear weak or don’t appear at all. An interesting curio but I would imagine unlikely to be all that significant. Hi. I have the Britannia coin, whilst they are both at about 12 o’clock, the queen looks right and Britannia looks left, is this correct? I have one of the incorrect coins, can send a picture if you like, is there still an interested market? HI I have Britannia coin 2016. do you know now which number on scale is ?? They seem to be quite common. No one knows how many were made yet. Got the email. Sell it as it doesn’t matter if it goes up or down. Money today is money today, especially if you got it for face value. i have a £2 coin that is 2016 that seems to be slightly unaligned. Only slightly, not as obvious as the 2015 coins you have shown. But have you or anyone else noticed this in the 2016 coin? I have a coin just like this that I have got from ebay (1.78 would you believe)! It is not, however, the Britannia design. It is a 2011 Technology ‘Standing on the shoulders of giants’ coin, and it aligned perfectly on both obverse and reverse. The two sides, however are misaligned by almost 180 degrees. Is this a known error coin or a one off? It seems the die has slipped so cannot be the only one? I will email you photos upon its highly anticipated arrival and will do a mirror shot once I certify it is not fake. The photos seem worthy though. Is a £2 struck as one piece by the way? No one seems certain of those I have asked. Thanks mate. There are a number of rotated die errors cropping up for £2 coins lately. I have one here (2015 tech reverse). 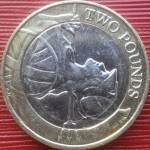 The £2 coins for circulation are made using 2 pieces, which are pushed together at the same time as they are struck with the dies. Interestingly, the coins for BU packaging have both pieces pushed together first and are then struck with the dies.